Honda Cars India expects to end the ongoing financial year with 8 per cent sales growth on account of good performance of its compact sedan Amaze, according to a senior company official. The company, which has completed the sedan line-up with the launch of the latest version of its Civic sedan priced between Rs 17.7 lakh and Rs 22.3 lakh, is also looking to fill gaps in its SUV line-up going forward to make a bigger presence in the Indian market. "In the April to February period this fiscal, our sales have grown 6.5 per cent. We expect to sell around 17,000 units in March taking our overall sales to 1.8 lakh units for the year," Honda Cars India Ltd (HCIL) President and Chief Executive Officer Gaku Nakanishi told PTI. He further said it would translate to a growth of 8 per cent from 1.7 lakh units sold last fiscal. During the ongoing year after a good start, there has been a slowdown in automobile sales in the latter half due to various factors, including floods in Kerala, increase in fuel prices, low finance availability due to liquidity crunch faced by NBFCs. "Our expectation is that (passenger vehicle) sales in March will be flat for the industry and the overall industry growth will be around 3 per cent, while Honda's will be more than double of that," Nakanishi added. HCIL's sales growth this fiscal has been primarily driven by compact sedan Amaze, he added. 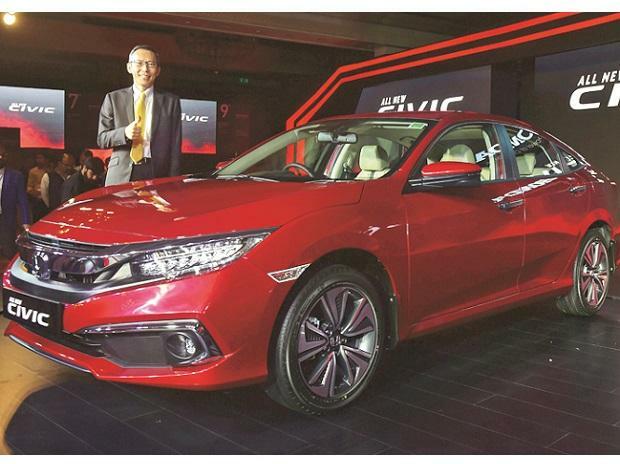 Commenting on the newly launched Civic, he said, "This completes our sedan portfolio in India." The all-new Civic comes with both petrol and diesel fuel options. The petrol versions will come with a 1.8-litre engine mated with a CVT (automatic) transmission. The diesel trims will come with a 1.6-litre engine mated to a manual six speed transmission. According to the company, the petrol variants deliver a fuel efficiency of 16.5 km per litre, while the diesel versions would offer fuel efficiency of 26.8 km per litre. Honda had discontinued the Civic sedan in India in 2013 after selling around 55,000 units since its launch in 2006. The new Civic in petrol is priced between Rs 17.7 lakh and Rs 21 lakh, while the diesel option comes at a price range of Rs 20.5 lakh to Rs 22.3 lakh (all prices ex-showroom). The company currently has sedans -- Amaze, City and Accord -- catering to various customers across different price points. Like the sedans, he said, "We also want to have a complete range of SUV. We know there are gaps in our SUV portfolio which we are working to fill." Nakanishi, however, did not elaborate when and how many SUVs would be launched in India. The company currently sells compact SUV W-RV, mid-sized B-RV and top end C-RV. When asked about the hatchback segment, where the company does not have a presence following the discontinuation of its Brio model, Nakanishi said Honda doesn't have plans to fill it at the moment. The Amaze will continue to be the company's entry-level model, he said adding that "the volumes that we lose out from not having Brio will be made up by sales from models such as the Amaze, Civic and others that we have in our portfolio".